I’ve posted several pieces pointing out that the idea of a united Europe, or a European parliament, ultimately goes back to the Quaker William Penn in the 17th and 18th century philosophers and idealists, such as Immanuel Kant. In his essay, On Perpetual Peace, Kant advocated the creation of a federal European state as a way of preventing further European wars. The great Italian patriot and revolutionary, Mazzini, also believed in a federation of European nation states, dedicated to peace. That notwithstanding the political divisions of Europe, this Congress instructs the General Council to further, through the international organisations, a policy having for its object the creation of a European public opinion in favour of Europe becoming an economic unity. (Francis Williams, Ernest Bevin: Portrait of a Great Englishman (London: Hutchinson 1952, p. 149). Although in 1927 Bevin no doubt underestimated the political difficulties in the way of European Economic Union and was somewhat too facile in his belief in a United States of Europe this speech is interesting not only for its evidence of the widening of his own view of the duty of the trade unions but because the premises on which it was based remained all his life fundamental to his view of international affairs. They later deeply influenced his policy as Foreign Secretary, not least in his response some twenty years later to Mr. Marshall’s Harvard speech on European economic dislocation the full significance of which, as the Annual Register at the time commented, “was not realised on either side of the Atlantic” until Bevin “grasped with both hands” the opportunity it offered of American aid in initiating European co-operation and thus brought into being the Marshall Plan. In 1927 he was thinking aloud, dreaming a little as he said because “to be a dreamer is sometimes necessary”, and his thoughts brought many angry responses from other delegates to the Congress. Some of them opposed him because they considered that it was the T.U.C.’s business to deal with practical matters and not waste its time on large visions of this kind, others because the idea of European union seemed to them to run counter to the old socialist ideal of an all-embracing international. To this latter argument Bevin replied belligerently that he was not less an internationalist because he was also a realist. It was fine to talk about a world-wide international. but that was far away. meanwhile trade barriers to Europe were keeping living standards low and big employers were developing cartels to safeguard their own interests at the expense of the community. His resolution was carried in the end by 2,258,000 votes to 1,464,000 although both the miners and the railwaymen opposed him. (pp. 151-2). In the past he had been preoccupied with the need to develop trade union power in order to establish a counter-weight to the organised power of employers. Now he saw the solution to many of the world’s economic problems in somewhat similar terms, preaching the need for Britain to develop, either through participation in an economic United States of Europe “spreading from the borders of Russia right to the borders of France”, or in a Commonwealth and European bloc or both, a counter-weight to the economic power of the United States and the potential economic power of Russia. (p. 153). This was one of the reasons the EEC, the EU’s precursor was founded – so that through an economic union European trade and industry could compete with the US and Soviet blocs. Moreover, the Social Charter in the EU safeguards some basic workers’ rights, rights that are severely threatened by the Brexit campaign. A week or so ago I had a debate on here with a critic, who objected to my crediting Aneurin Bevan with the creation of the NHS. He asserted that the Beveridge Report, on which the NHS is based, was a policy of the wartime National Government, and also had Conservative support. This is true. However, the Beveridge Report was based on the work of Sidney and Beatrice Webb and the Socialist Medical Association, who had been demanding a free medical service for decades. Indeed, a free health service had been Labour party policy since the 1930s. And while the Tories in the Coalition government also supported Beveridge’s outline of the welfare state, it had particularly strong support in the Labour party. Pauline Gregg in her book, The Welfare State, describes the massive popularity the Beveridge Report enjoyed with just about all parts of the British population on pages 19-20. On November 20, 1942, only seventeen months after the appointment of the Committee, it was ready and signed. On December 2, it was made available to the public, and seen at once to go even beyond the expectations of The Times. Though called, simply, Social Insurance and Allied Services, it was an eloquent cry to end poverty, disease, and unemployment, and purported to supply the means of doing so. Its appeal was instantaneous. Queues besieged the Stationary Office in Kingsway. Not only the Press but BBC news bulletins summarized the Report. Brendan Bracken, the Minister of Information, needed only a few hours in which to perceive its enormous propaganda value, and soon it was being trumpeted across the world in many languages. At the cost of 2s, the then normal price of a government White Paper, it immediately became a best-seller at home and abroad, the subject of leading articles, letters to the Press, speeches and discussions at every level of society. Beveridge himself explained his Plan to millions on the radio and on the cinema screen, as well as addressing countless meetings. In twelve months 256,000 copies of the full Report were sold, 369,000 copies of an abridged edition, 40,000 copies of an American edition. Permission was given for translation into Spanish, Portuguese, and German. Translations were published in Argentina, Brazil, Portugal, Mexico, and Switzerland. Parts 1 and VI were translated into Czech, the abridgement into Italian and Chinese. The Trades Union Congress and the Co-operative Party gave it their blessing. the National Council of Labour, representing all the bodies of organized Labour, called for the legislation necessary to implement the Report at an early date. The Liberal Party supported it, and through Geoffrey Mander welcomed the general principles of “that momentous report”. A group of young Tories tabled a motion in the House of Commons requiring the Government “to set up forthwith the proposed Ministry of Social Security for the purpose of giving effect to the principles of the Report”. “We believe”, said Quintin Hogg, who sponsored this motion, “the keynote of the restatement of political controversy after the war to be practical idealism.” The Beveridge scheme, said another Tory Member of Parliament, “touches the individual life of every man, woman and child in the country and reaches deep down into the homes of the people”. The Labour Party made the Report peculiarly its own. “It expresses”, said Sydney Silverman at its Conference in 1943, “the basic principle of this Party, the only thing which entitled us at the beginning and entitles us now to regard ourselves as fundamentally different from all other parties.” The Report, wrote The Times, had changed the phrase “freedom from want” from a vague though deeply felt aspiration into a plainly realizable project of national endeavour. “Sir William Beveridge and his colleagues have put the nation deeply in their debt, not mere for a confident assurance that the poor need not always be with us, but far a masterly exposition of the ways and means whereby the fact and the fear of involuntary poverty can be speedily abolished altogether.” The Report, it concluded, “is a momentous document which should and must exercise a profound and immediate influence on the direction of social changes in Britain. Gregg notes on page 23 that in the House of Commons, when it came to a vote only a minority voted for the immediate implementation of the policy. In the end the Labour Party tabled an amendment calling for the early implementation of Beveridge’s plan as a test of Parliament’s sincerity. She also notes on page 25 that many Tory MPs voted against the motion as a reaction against the Plan’s support by Labour. The commenter also found my story, about how the pharmacist father of one of my mother’s friends declared he was going to vote Labour because so many people needed the NHS ‘absurd’. This was presumably because he couldn’t accept the idea of a true-blue Tory businessman ever voting Labour. But this paragraph shows this was pretty much what did happen, and the government knew it the moment the Tories voted against the Labour motion. As for Sydney Silverman’s statement that support for the welfare state is what makes the Labour party fundamentally different from all other parties, it’s a pity that this wasn’t taken on board by Tony Blair and Gordon Brown when they decided to continue Thatcher’s programme of dismantling the welfare state and privatising the NHS. And it’s a pit that it isn’t recognised by Bliar’s successors – Liz Kendall and now Dan Jarvis. Mike over at Vox Political a week or so ago carried the news about Esther McVey being given a new, parliamentary job by Cameron despite losing her seat at the last election. McVey was, as you will recall, Ian Duncan Smith’s minister in charge of inhumanely and inhumanly culling the disabled. She also appears in this week’s Private Eye, for 11th – 18th December 2015. The Eye reports that the Wicked Witch of the Wirral has got a job with a London bank providing financial services for the mega rich. Former Tory employment minister Esther McVey, turfed out of parliament in May by the voters of Wirral West, has now found gainful employment herself servicing the needs of the richest people in the world. According to the advisory committee on business appointments (Acoba), Mc Vey is now a special adviser to the Floreat Group, a London-based “multi-family private office” – that is, a company that acts as financial adviser, bank, and general wet-nurse to super-rich families, or ultra high net worth individuals (UHNWIs) as they are known. Floreat, mostly owned by Hussam and Mutaz Obaibi, originally had a strong base in Switzerland, where its aim was to “manage discreetly all financial and personal matters” of a group of rich families, predominantly from the Middle East and Europe. For the past seven years it has been more UK-based, and has hired McVey for one week a month for “information gathering, performing due diligence and research”. This is a far cry from her days as employment minister when she increased the power of government to impose sanctions on unemployed people’s benefits, and argued that the jobless could start “working at Costa” to climb the career ladder. McVey isn’t the only former MP now to be serving the super-rich. Tory Tony Baldry and Labour’s David Blunkett have also taken jobs with multi-family private offices, at Werner Capital and Oracle Capital, respectively. This tells you precisely all you need to know about Esther McVey and the Tories. She never gave a dam’ about the poor or the disabled, but simply wanted to mix and serve the immensely, and uselessly rich. She, Baldry and Blunkett are examples of how, under New Labour and Cameron, government worked for the rich and the corporations against the people. Exercise Your Political Rights: VOTE! Today’s polling day, as I’m sure just about every one of my readers is aware. 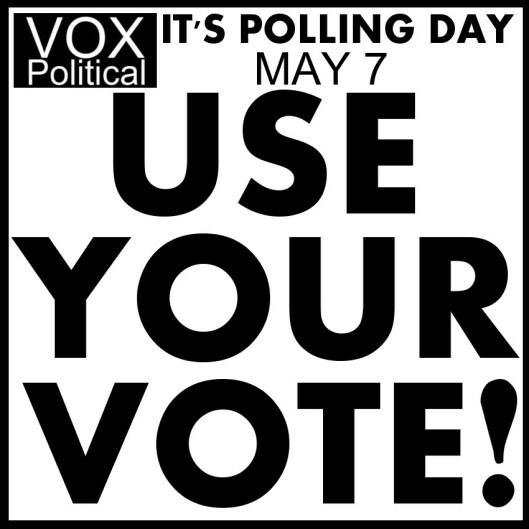 I’ve reblogged a number of memes from Vox Political over the past few days, urging people not to vote the Tories and Lib Dems back in. Mike’s posted another piece over on his site, simply asking people to vote. And he’s produced this graphic for further encouragement. Remember – the Tories and Lib Dems have reformed the registration system, just to prevent people from voting. This is how they view democracy, despite all the rhetoric about defending and promoting it through ‘localism’, or some such ideological camouflage. They fear it. Just have tyrants have always feared it. So defy them. Don’t give in to apathy, or pessimism. Use your franchise. The Francophone Swiss philosopher, Jean-Jacques Rousseau, said that the man, who votes, but doesn’t want anyone else to, wishes to be a master. The one, who doesn’t, wishes to be a slave. The Tories are always keen to get their people to vote, and vote first. Because they do see themselves as the masters. Mike’s short piece is over at http://voxpoliticalonline.com/2015/05/07/at-long-last-election-day-is-here-vote/. Go there for further electoral encouragement. But you don’t have to accept the status of slaves. Ed Miliband this week announced he was to abolish the non-dom tax bracket, that allows businessmen and others to avoid paying taxes in this country on the grounds they are living abroad. One of the most notorious beneficiaries of this arrangement has been Lord Rothermere, the owner of the Daily Mail. Rothermere inherited his non-dom status from his father, who lived for most of his life in France. The current Lord Rothermere, however, shows every evidence of living in Britain, even building what amounts to his own stately home. I put up Private Eye’s article on how Rothermere was using his non-dom status to avoid paying tax on his millions. And on Wednesday, the day that Miliband announced his policy, it was by far and away the most popular article on this blog. It’s almost needless to say that Miliband’s policy was much less popular with the right-wing press, who all harrumphed about how this was going to harm Britain by driving all the non-domiciled rich titans of industry and Lord Rothermere away. Yet Rothermere’s mighty organ, the Daily Mail, has also shown the immense hypocrisy it’s known for by attacking other companies for avoiding UK tax. In 2010 it launched a campaign against Kraft foods, which Private Eye reported and criticised in a brief article in its issue for the 23rd December. “If you won’t pay our taxes, we won’t eat your cheese, Kraft.” So runs the Mail on Sunday’s campaign against the US firm that has taken over Cadbury and is transferring ownership of some of Britain’s favourite brands to Switzerland to avoid tax. Another internationally tax-efficient company of course is the Daily Mail and General Trust, owned through a Bermudan company and a series of offshore trusts so that the principal beneficiary, the “non-domiciled” Lord Rothermere, can avoid tax on his income from the group. The Mail was absolutely right in that Kraft should pay taxes in Britain for profits raised through its British firms. As should the Daily Mail, who, after running this campaign, should keep resolutely silent about Miliband’s campaign to end the non-dom tax breaks.